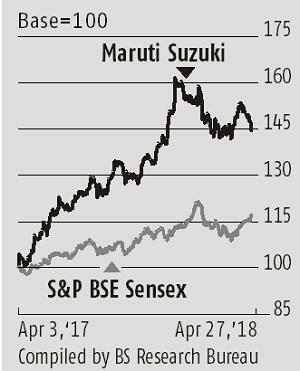 Maruti Suzuki’s March quarter numbers were a mixed bag. While the top line, led by strong volumes and higher realisations, came in better than estimates, the operating performance pegged back by higher operating expenses dented margins. One-off interest costs led to lower net profits, which came in below estimates. The stock, which has gained about 38 per cent over the past year, shed 2 per cent after the results were announced. There is, however, nothing to complain about as far as volume performance is concerned. Even as the sector struggles with single-digit growth, consumers can’t have enough of India’s largest carmaker. Led by a 11.4 per cent increase in volumes which include models with a waiting period and three per cent higher realisations, the company’s revenues, at Rs 205.94 billion, was in line with analysts’ estimates. Volumes and average selling prices are on the higher side given increasing demand for premium cars and utility vehicles. While overall volumes continue to be driven by the compact segment (Ignis, Baleno and Dzire, among others) which accounts for 45 per cent of volumes, sales growth of utility vehicles is the highest both for the quarter and the year. Ertiga, Vitara Brezza and S-Cross have helped the company gain over 27 per cent share in the segment for FY18, with volume growth for the first two models at 36-44 per cent for the full year. The company seems confident of maintaining double-digit growth with both rural and urban markets contributing to FY19 volumes. 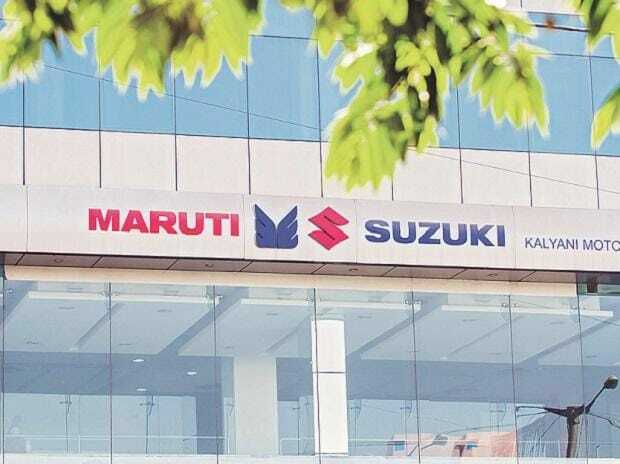 The rural sector, which accounts for 36 per cent of the sales, is growing at a higher clip (16 per cent) than the urban segment and expectation of a normal monsoon, improving farm incomes and rural infrastructure is expected to rub off positively on sales, given Maruti’s brand and distribution leadership. While overall sales are robust, margins — which came in at 14.2 per cent — were over 150 basis points lower than analysts’ estimates, given a sharp rise in other operating expenses. The company indicated that higher freight expenditure, exchange variation pertaining to royalty payment, higher power, fuel costs and advertisement costs related to the new Swift launch was responsible. Going ahead, there are a couple of headwinds in the form of an appreciating yen, which makes imports costlier. With commodity costs increasing, the management will have to take a call on increasing product prices. The company has been absorbing the higher costs by cost reduction methods, gains from economies of scale and has raised prices marginally. The other area the Street will look at is falling royalty rates which came in at 5.4 per cent of sales for FY18 as compared to 5.8 per cent in the previous year. The management indicated that for models launched after January 2017 (Ignis, Dzire and Swift) royalty paid will be in rupees which will trend down as volumes improve.